"Sampath Speaking" - the thoughts of an Insurer from Thiruvallikkeni: Flipkart Big Billion Day - a Flop show or easy achievement for promoters ? 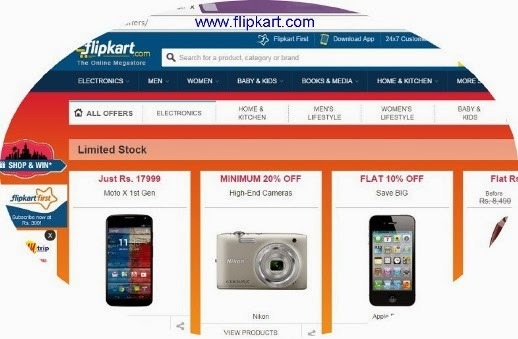 Flipkart Big Billion Day - a Flop show or easy achievement for promoters ? Till a couple of decades ago, people waited for Deepavali Bonus to do shopping – it was mostly clothing, closer to the festival – it would be crackers and sweets. Will modern day youngsters ever know that people flocked some shops like NTC, Vaanavil because they allowed instalments ! – only handful boasted of Credit cards and those who did not possess one, used to say that having a credit card will make one do impulsive purchases – i.e., spend when it was not needed and buy not so required things on credit. Credit card revolution changed it al- - with people living on credit all the time – and only those who use cards extensively being respected by Organisations too… Some shops would announce discounts and Sales ~ the common perception was that shops would hike the price and offer back something as discount !! People would throng shops, feel the material, check it on hand, compare and decide on buying (another, that women usually spent long hours in Shops !!) …. Window shopping" is a term referring to the browsing of goods by a consumer with no intent to purchase, either as a recreational activity or to plan a later purchase. On the contrary, Showrooming is the practice of examining merchandise in a traditional retail store without purchasing it, but then shopping online to find a lower price for the same item………………, do you make Online purchases regularly ! and were you smitten by Flipkart flopshow !!! The social media has been talking of it – and this morning Times of India (Chennai Edition) had 4 full pages – the front and back wrappers fully devoted to Flipkart announcing ‘Big Billion day’ campaign – the 2nd firstpage was of Snapdeal which read “ ‘for others it’s a big day – for us, today is no different’. Flipcart shouted – Crazy Deals, Limited Time, Limited stocks ….. and more .. On crazy side it was Singer Hand blender at Re.1; Adata 2TB Extnl Harddrive @ Rs.600; Samsung Galaxy Tub 2 P3110 at Rs.1390/- ………….. unbeatable prices read Canon 1200D DSLR at Rs.17500/- LG 32’ LED TV at 14900 – an interesting report in Firstpost mentions that a certain section of online buyers claimed that Flipkart had allegedly increased the price on products and was offering discounts on these marked up prices. According to this piece, Flipkart had suddenly marked up the prices of certain non-tech products just today. Many said that the price in First screen and the 2nd were different !!!!! A more detailed thread on Reddit India threw up a lot of instances of people, who have been regulars on Flipkart, claiming that prices on certain products are even higher than that seen on regular days. For instance, Reddit user rahultheinvader claimed that this book , which was priced at Rs 400 before Oct 6th, had suddenly shot up to Rs 599. A quick search on other e-commerce sites gives you lower prices. In another instance, another user, claimed that the iPad Mini (16GB, Wifi) pricing hovered around Rs 17,000 since the last month, but was showing as Rs 21,000 today. Another example showing a higher pricing is that of the Seagate Backup Plus 1TB external drive which is shown to be selling for Rs 7,199 and this drive is a generation older. Since the launch price of the latest generation Seagate Backup Plus was around Rs 6,000. TOI and Hindustan Times reports that the site crumbled due to increased load throwing random errors. A large number of consumers were not getting order confirmation after making payments and some were not able to see items they added to their shopping cart. The consumers shared their grievances on social networking website, Twitter. In case you don't know what the Big Billion Day Sale was all about - Flipkart aimed to do business of more than 1 billion in one day on 6th October 2014. Some reports put it that it achieved its sale target by 2pm. It is like people saying the movie is not good – yet grossing up rich moola in box office - Flipkart and its Big Billion Day campaign may have had a forgettable day on Twitter but the e-commerce site's co-founder, Sachin Bansal, claimed the day was an unprecedented success, with the site registering a billion hits and touching $100 million in gross merchandising value in just 10 hours. Flipkart is an e-commerce company founded in 2007, by Sachin and Binny Bansal operating exclusively in India, headquartered in Bangalore, and registered in Singapore, owned by a Singapore-based holding company. So what did you buy today and did you make any attempt in flipkart. ! !